Our Bloody Mary Marinara lends a zesty, spicy, savory kick to a hearty wintry dish! We love it over Trader Joe’s Cauliflower Gnocchi for a healthier twist. NOTE: This recipe calls for the use of an Instant Pot, but can be done in the slow cooker instead! If doing so, just do steps 1-3 in a pan on the stove, and then cook everything in the slow cooker on low for 8 hours. Turn instant pot on to the sauté setting. While it’s heating up, trim any excess fat from the short ribs, and pat dry with a paper towel. Generously season the meat with salt and pepper. Add oil to the Instant Pot. Add the short ribs to the hot oil and sear on all sides until brown. Remove from pot and set aside. Use tongs & paper towel to remove any excess oil from the pot. Add onion and garlic and sauté until tender, about 3 minutes, scraping the browned bits off the bottom of the pot. Pour wine in to deglaze and cook for about 2 minutes. Add short ribs, Bloody Mary Marinara, salt and crushed red pepper to pot. Use 1/4 cup water to rinse out sauce jar and add to pot. Set Instant Pot to the stew/meat setting for 35 minutes. When finished, let it sit untouched for a natural steam release. Remove meat to sheet pan. Shred into small pieces, removing bones and any large pieces of fat. Meanwhile, set the Instant Pot to sauté again to reduce/thicken the sauce. Skim any fat off top of sauce and add meat back in. Taste and add salt & pepper if needed. While keeping the Ragu warm, prepare Cauliflower Gnocchi (or any gnocchi you’d prefer!) according to package instructions. 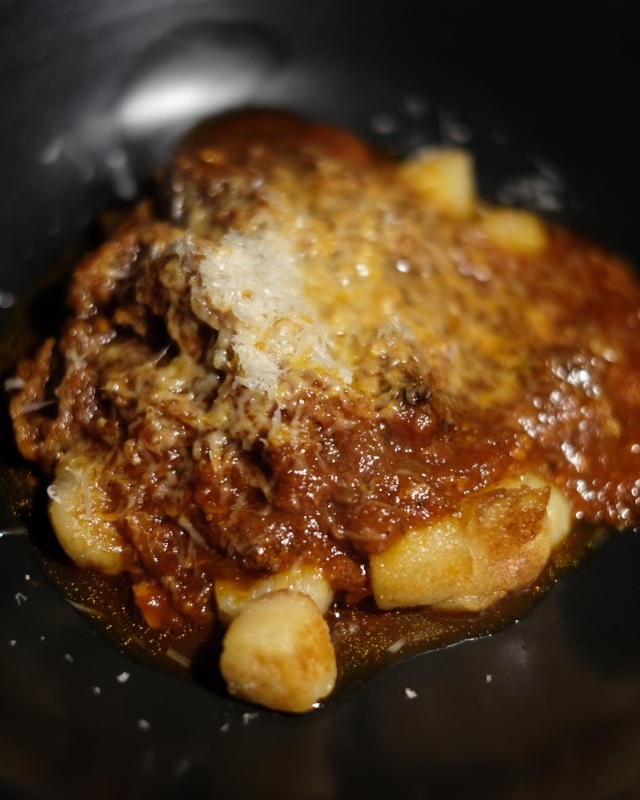 Serve a generous helping of Ragu over plated gnocchi and top with plenty of Parmesan!